With its combination of cute characters, kid appeal, and detailed fighting scenes, the Precure metaseries is presently the most popular and prominent magical girl anime. Though each series has its own share of unique features, one constant that always impresses me is the approach Precure takes to showing strength in its heroines. When it comes to depicting strong female characters, there is a lot of media out there which relies on some sort of conflict revolving around a character’s gender. Confronted with a sexist/condescending/ignorant adversary, the idea is that the girl then shows what she’s made of and proves her equality/superiority. This is not inherently a problem, and there are many examples out there which make such scenes empowering, but there are also many cases where this becomes lazy or uncreative shorthand for conveying “girl power” as a way of achieving the bare minimum of inspiration. The gradual building of inner strength and emotional resolve in Heartcatch Precure! 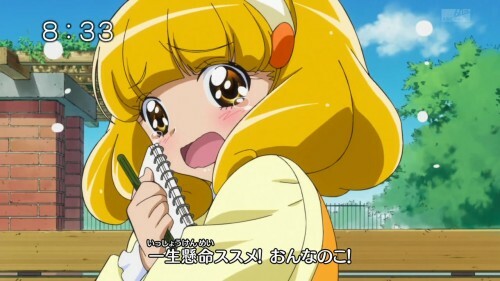 is the obvious example, but let’s instead take a rather stereotypically feminine-looking character such as Kise Yayoi (aka Cure Peace) from Smile Precure! Yayoi can be described as a crybaby who’s full of enthusiasm but lacking in confidence, a point which the villains will constantly bring up to taunt her. 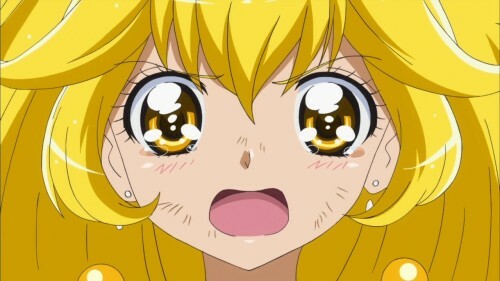 In regards to strength, Smile Precure! does two things. First, it provides four other girls to show how crying is not just something girls “do,” but something specific to Yayoi as an individual person. Second, it has Yayoi prove that being a crybaby doesn’t mean you’re incapable, it just means you can be capable while also crying a lot. Even with a character such as this, where it wouldn’t be surprising to see a show convey her as “strong, for a girl,” Yayoi’s gender is never the issue. This is not to say that Precure is devoid of traditional notions of femininity, as other signature features are brightly colored frilly outfits and cosmetics/accessories-based merchandise, not to mention the rare romance. With respect to the potential and capability of of girls, just as there’s no need to spend time in a film or cartoon to show that the sky is blue or that fire is hot, this approach treats the existence of strong female characters as such an obvious non-question that it becomes capable of normalizing the very notion that girls are strong. Without the need to “prove” anything, it can tell stories without being bogged by the classic obstacle that is the gender-centered confrontation. This entry was posted in anime, mahou shoujo, pretty cure and tagged cure peace, heartcatch precure, kise yayoi, precure, smile precure, strong female characters. Bookmark the permalink.